The newly released 2050 Global Calculator illustrates the potentially disastrous impacts of failing to act on climate change, and highlights sustainable transport as pivotal to containing global temperatures. 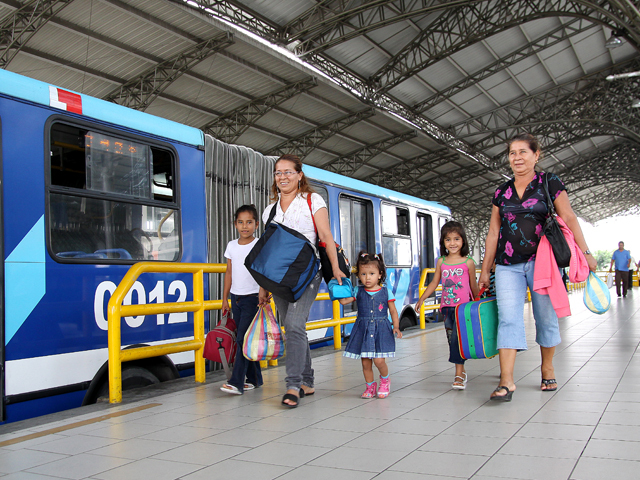 Photo by Metrovía/SIBRT. Disclaimer: the calculations below are based on a preliminary, beta version of the Global Calculator. To view and explore the final version of the Calculator, visit tool.globalcalculator.org. Experts predict that a 2 degree Celsius rise in world temperatures could have drastic effects, including reduced crop yields, grave damage to ecosystems, and extreme weather. Some research even indicates that a 1 degree Celsius rise in global temperatures could lead to dangerous impacts like rising sea levels and the extermination of certain species. The newly launched 2050 Global Calculator tool not only visualizes this alarming path, but also its more sustainable alternatives. Developed by a cohort of experts and international organizations – including the World Resources Institute’s (WRI) EMBARQ program, producer of TheCityFix – the Global Calculator aims to be the most open-source model of the world’s energy, land, and food systems. The interactive tool allows users to explore many options to reduce greenhouse gas (GHG) emissions through changing technologies, fuels, land use, and lifestyles up to the year 2050. As part of the team working on the transport section of the Global Calculator, we at WRI and TheCityFix are excited by the opportunity to contribute to a new tool that is sophisticated yet accessible, and shows how prioritizing mobility solutions that reduce car-dependency and expand sustainable transport systems can help to contain global temperature rise. The Global Calculator project is led by the United Kingdom Department of Energy and Climate Change (DECC). Originally, DECC built a United Kingdom calculator, which was used to inform policy debate on trade-offs between different possible actions to reduce CO2 emissions. This tool is helping the U.K. to meet the legal requirement the country has set to reduce emissions by 80% by 2050 from 1990 levels. Since then, DECC has helped develop country-level calculators for Belgium, China and South Korea, and is currently supporting the development of 11 additional country-calculators by the end of 2014. The Global Calculator builds on these tools by modeling various trade-offs at a global level and accounting for the finite amount of resources available worldwide. The Global Calculator is divided by sector and allows users to choose a future pathway for each sector based on four levels of effort. These levels let users explore the impacts of continuing business as usual versus pursuing ambitious measures to curb emissions through actions like reducing car usage, shifting to renewable energies, or improving plant yield efficiency. Energy consumption in the transport sector has steadily increased over the last 40 years. Light-duty vehicles – the typical private car – are both the largest fuel consumers and one of the fastest growing, contributing to transport’s share of global GHG emissions. Graphic by International Energy Agency. In 2011, transport made up about 22% of global GHG emissions. As shown above, roughly 80% of total transport energy use comes from road transport, and oil use in the transport sector is steadily growing. The Global Calculator allows users to see the impact on future emissions of altering passenger and freight demand, mode shares, occupancy and load, vehicle efficiency, and the number of hydrogen and electric vehicles. In total, the preliminary version of the Global Calculator shows that the transport sector has the potential to increase or decrease total CO2 emissions by up to 20%. The initial results from the Calculator show that even with some effort in other sectors, failing to address emissions from transport could lead to a 2 – 6.6 degrees Celsius increase in global temperatures. In total, the preliminary version of the Global Calculator shows that the transport sector has the potential to increase or decrease total CO2 emissions by up to 20%. Growing cities have the opportunity to significantly reduce emissions by focusing on compact, mixed-use development in order to reduce the need for car usage, while also investing in sustainable transport alternatives. While significantly reducing emissions presents a challenge for local and national governments, it also represents an opportunity to improve citizens’ quality of life. For example, bus rapid transit (BRT) reduces emissions from private vehicles while also easing congestion and decreasing commuting times. Mixed-use development not only reduces the need for car transport, but it also creates shared community spaces and fosters interaction among community members. Transport reform alone is unlikely to mitigate climate change, and actions in many sectors are needed to avoid major disruptive lifestyle changes. Tools like the Global Calculator are critical to help governments understand the relative impacts of their decisions and form comprehensive strategies for reducing emissions. The 2050 Global Calculator still under review, and experts are invited to comment on the tool to provide feedback until August 29, 2014. About the author: Erin Cooper is a Research Analyst with EMBARQ, the sustainable transport initiative of the WRI Ross Center for Sustainable Cities. She is part of the team leading the transport sector calculations for the 2050 Global Calculator. Learn more about EMBARQ’s work contributing to the transport sector calculations of 2050 Global Calculator here. The UN Climate Summit: What's in it for Cities?